Preheat one side of the grill for indirect cooking. Using a disposable aluminum pan or other grill-safe pan, add beer and onions and bring to simmer. Add sausages, turning to simmer 15 minutes per side. Once done, remove from pan and grill over high heat until just browned, about 1-2 minutes per side (160 degrees internal temperature). Set aside. 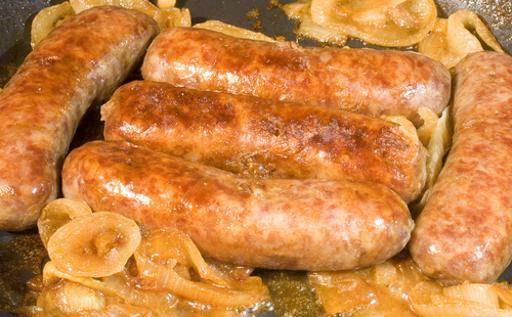 While grilling bratwurst, add into the pan all remaining ingredients and stir. Cook sauce until thickened, about 20 to 30 minutes. Place the brats back into the sauce for serving and enjoy with toppings of your choice! Hint: Love beer cheese sauce? The pan sauce makes a great base, just add your favorite cheese!